On December 24, nearly all the churches on Mallorcan hold the "Matines", the Christmas Eve service to commemorate the birth of Jesus. The chant of the Sibil·la, with ancient origins, is one of the most emotional moments of this celebration. The chant foretells the end of the world and it is a grand ceremony starring a young boy or girl with a high voice, dressed in a tunic, a robe of embroidered silk and bearing a large sword. 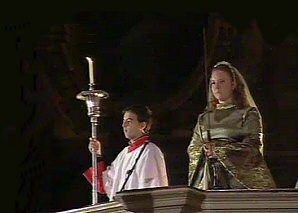 The "Matines" at the Sanctuary of Lluc, where the Sibil·la is sung by a young "Blauet", are one of the most popular on the Island, together with the "Matines" that are celebrated at the Palma Cathedral. The chant is also the central part of the "Tradicional Festa de la Sibil·la" by the Capella Mallorquina that takes place every year on December 26, at 7 p.m., in the Santa Eulàlia church in Palma.